This piece came to me through my friend Christia and shows how imparting knowledge to each other in the world of research is so important. 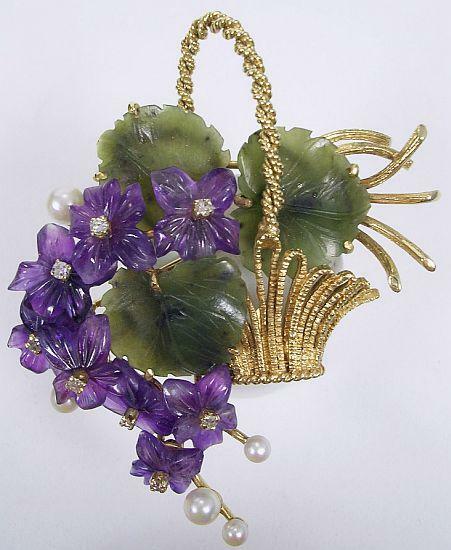 Knoll & Pregizer is known as a costume jewelry company. Their ads even say "Imitation Jewels". In a Post WWII German record I found a listing for KP as "Goldschmuck"-Fine Jewelers (meaning they worked in at least the minimum of 8K gold as well as making imitation jewelry in sterling.) Until I had seen this piece, the only gold jewelry I knew of was their watches. However, I found the registered KP trademark in the US in 1962 as "sellers of precious and imitation jewelry", so the 60s must be when they began making this type of jewelry. They probably decided to go into the fine jewelry business towards the end of their long career of making imitations because business was bad and imitations weren't selling. Theodor Fahrner also worked in gold towards the end of their business.